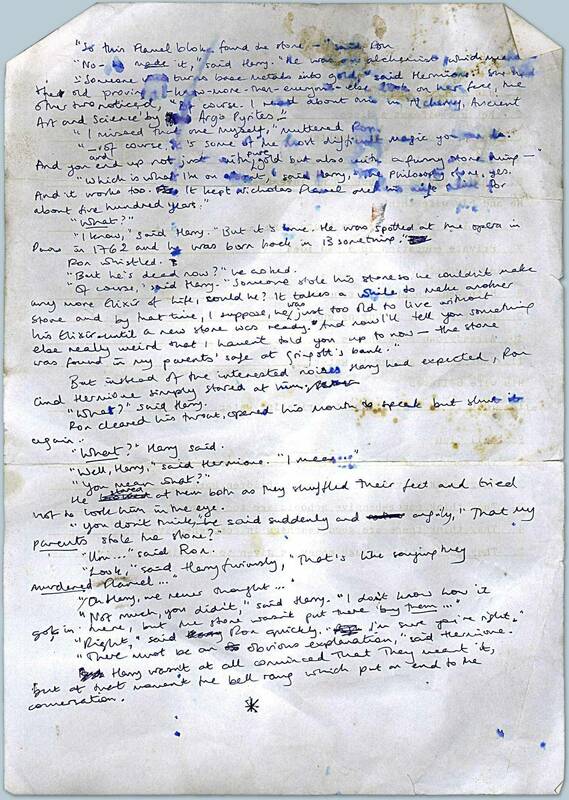 "Very Early page of Philosopher's Stone written around 1991 and showing plot-line that was abandoned. Would have changed everything!" “So this Flamel bloke found the Stone -” said Ron. “No - he made it," said Harry, “He was an alchemist. Which means -"
“And of course it's some of the most difficult magic you can do. And you end up not just with pure gold but also with a funny stone thing -"
“But he's dead now?” he asked. But instead of the interested noises Harry had expected, Ron and Hermione simply stared at him. Ron cleared his throat, opened his mouth to speak but shut it again. He stared at them both as they shuffled their feet and tried not to look him in the eye. “There must be an obvious explanation," said Hermione. Harry wasn't at all convinced that they meant it, but at that moment the bell rang which put an end to the conversation. (Major kudos to Wampus from Reddit for the image and Sherlock+HarryPotter from Imgur for the transcription which I adapted). Nicolas Flamel is already dead. The Stone was kept in the Potter vault (not vault 713). The Stone was stolen from Flamel at one point. By implication, the Stone was stolen by Lily and James. I suspect that when JK Rowling says that this page "would have changed everything" she's talking about more than the plot of the first book. The ramifications of this early draft seemingly would have altered the entire series and taken it in a totally different direction. Yet what are those ramifications? What would it have changed? How would Lily and James owning the Stone have swung the series? I'd be very interested in whether JK Rowling has clarified this point, or made any further comment on this draft. Browse other questions tagged harry-potter behind-the-scenes or ask your own question. What are the ways of someone identifying him/herself at Gringotts? Why did Hagrid say that Snape was one of the protectors of the Philosopher's Stone?